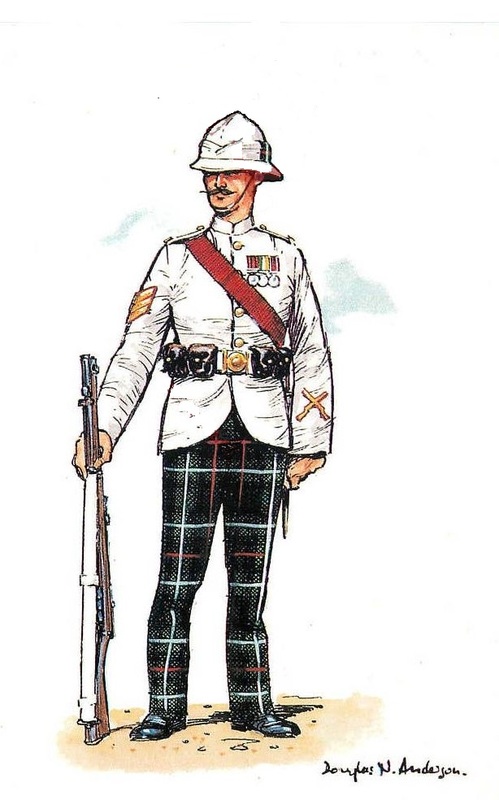 Highland Light Infantry | The British in Crete, 1896 to 1913. In a recent blog I made note of the fact that in 1903, British troops on Crete were drinking alcohol and smoking tobacco. It appears that the rot had set in much earlier! 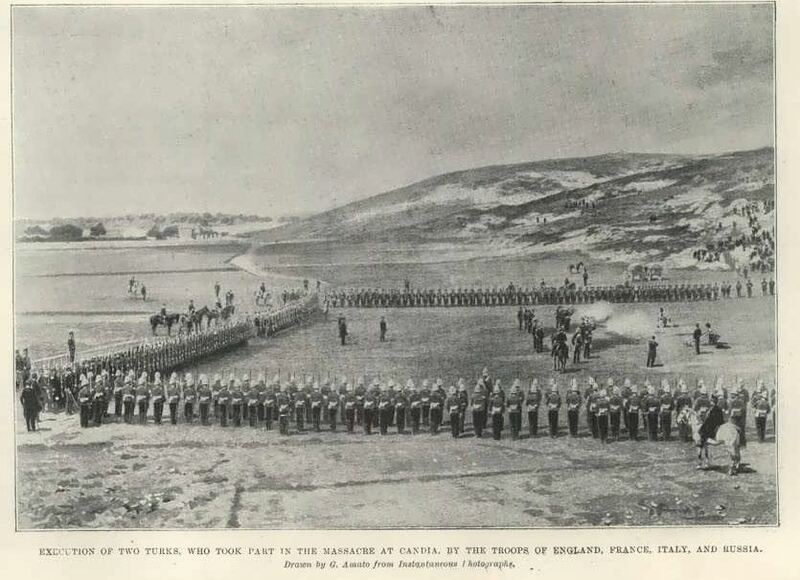 The following was taken from page 43 of The Highland Light Infantry Chronicle, published in 1906. ‘When stationed in Canea in 1898, the Sergeants of the Detachment were entertained to a smoker by the 5th Infanterie de Marine (French). The concert was held in a broken-down house, about fifty yards from our Barracks. The whitewashed walls were rather neatly decorated by such mottoes as “Kick politics out of the window,” “Long Live Scotland,” “Queen Victoria very good,” etc. The songs were delightful – more so as we could not understand each other -and the applause would have delighted a Gibson Girl*. Dumb toasts, where liquor was freely consumed, were greatly in evidence. About 10p.m. the company became rather boisterous, so signs were made that, as we were so close to the Barracks, we had better adjourn to a neighbouring vin shop, kept by the ubiquitous Greek. 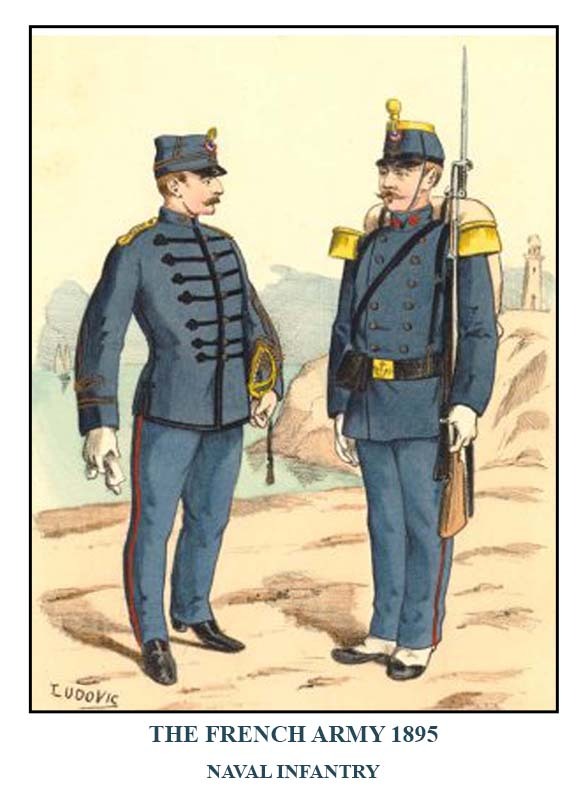 When there, the fun became fast and furious, and, naturally, uniforms were changed, the writer feeling quite French in a kepi and tunic (blue). A certain fat colour sergeant, with a bald head, was singing “I like the Frenchy girls,”** when the concert was brought to a very abrupt ending by the entry of a very excited French sergeant, who, with many gestures, yelled out, “Patrol, Patrol, Francaise!” All exits were speedily used. The writer saw his white jacket, (worn by a French sergeant) disappearing up the chimney. I sat still, rather confused, and, the doors being forcibly opened, I beheld the officer of the patrol. I wish I could understand what he was talking about. I know that he hardly paused to take a breath, and I am sure I got a good wigging. At last he stopped, and I thought it time to say something. So I stood to attention, and, pointing to my tartan trews,*** said, “I am very sorry, but I am unable to speak French.” The officer again became very talkative. The only word I remember was one that sounded like “fraternise.” He allowed me to go home, for which I thanked him.” W.T. Unfortunately, Sergeant W.T.’s full name is not recorded. 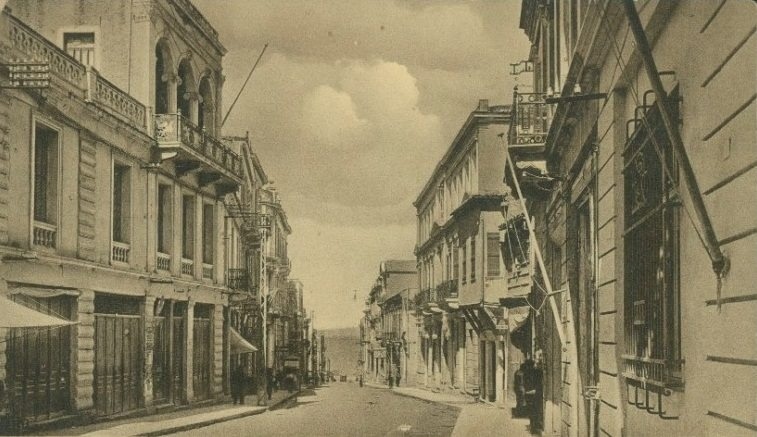 While the majority of British troops were based in Candia (Iraklion), a small detachment was stationed in Canea, the then capital of the island. While the Canea secteur was under the control of the Italian contingent, the town itself was under the joint control of all the Powers. W.T. was presumably one of the senior N.C.O.s in the British contingent at this time. *The Gibson Girls were an American cartoon personification of what was considered a shockingly ‘modern’ women in the late 1880s. ***At the time of the European Intervention, the Highland Light Infantry were the only Highland Regiment to wear trews rather than kilts. In spite of their name, most of their recruiting took place in the Lowlands of Scotland, particularly in, and around, Glasgow. Sergeant, Highland Light Infantry in hot weather uniform c.1905. Douglas N. Anderson. This entry was posted in Highland Light Infantry and tagged 5th Infanterie de Marine, Crete 1898, European Intervention Crete, French Marine Infantry Crete1898, Highland Light Infantry Crete 1898 on January 27, 2018 by Mick McT. On arrival in Candia in 1897 British troops were faced not only with insanitary conditions in the town, but also with an inadequate supply of suitable drinking water. The water in the town was condemned as being too chalky and 45 tons brought from Malta had turned bad. The initial solution was to retain the hired transport SS Clyde which had brought the 1/Seaforths from Malta, to supply water. 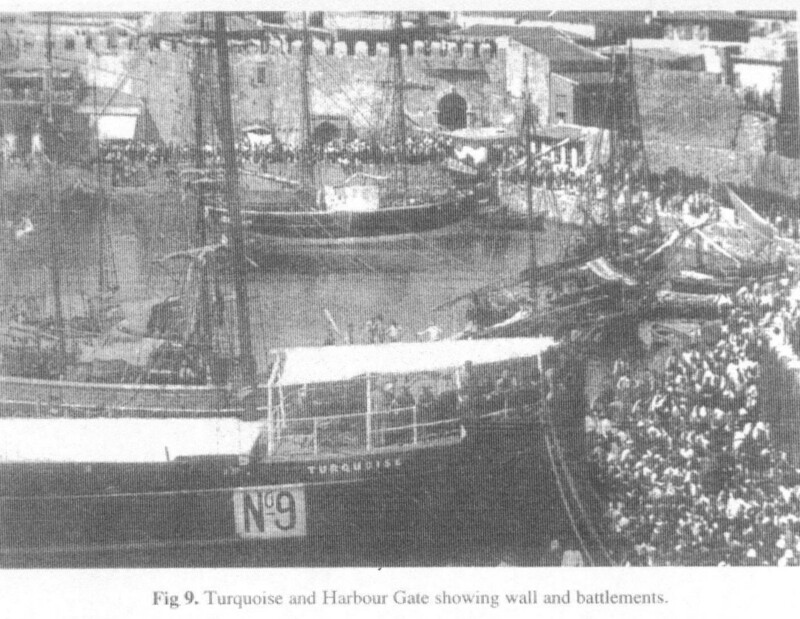 A longer term solution was found by using the distillation vessel ‘Turquoise’, anchored in the inner harbour, to provide a semi-permanent water source. The Turquoise was to feature in the events of 6th September 1898 when Cretan Muslim rioters opened fire on British troops in the harbour. During the fighting members of the Highland Light Infantry and sailors from the Turquoise and H. M. S. Hazard made use of the Turquoise in defending the customs house, the Dime, and the harbour. 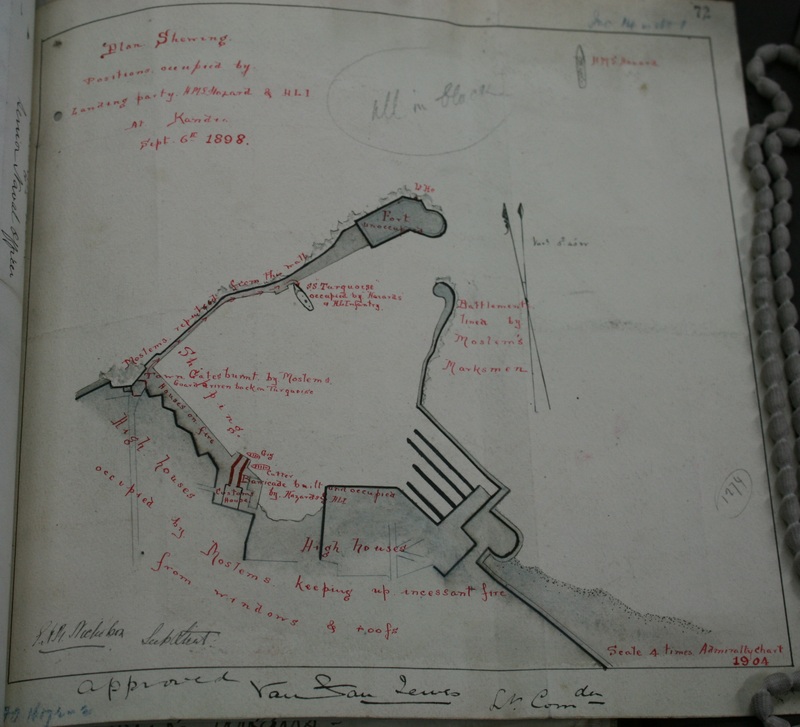 Contemporary map of Candia harbour showing position of S.S. Turquoise during fighting of 6th September 1898. 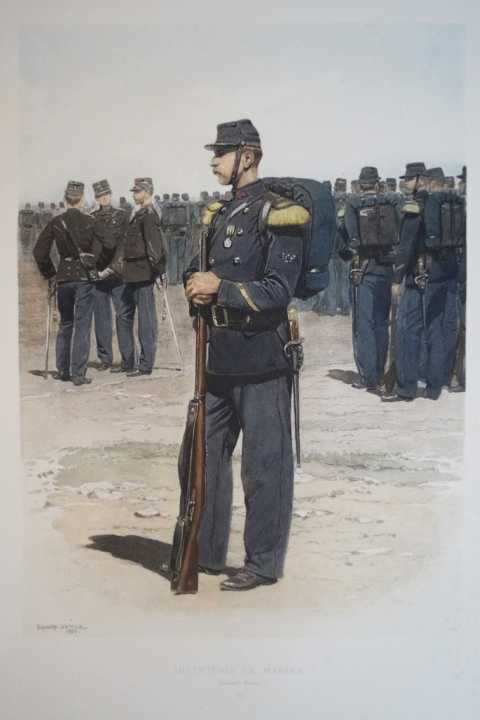 This entry was posted in British Army in Crete, Highland Light Infantry, Royal Navy in Crete, Uncategorized and tagged Crete 1898, Crete 6 September 1898, European Intervention Crete, S.S.Turquoise on May 10, 2016 by Mick McT. 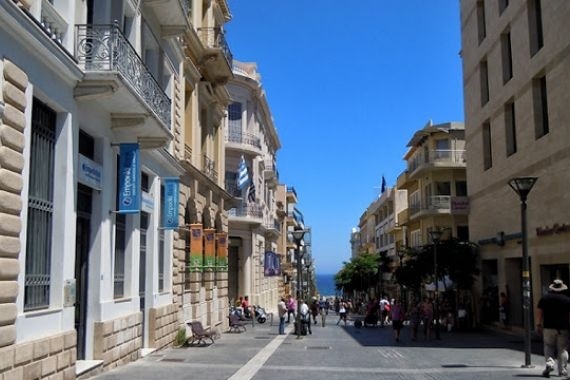 Iraklion, 25th August Street…then and now. On 25th August 1898 by the Cretan calendar, or 6th September by the British one, a serious riot resulted in the destruction of a large portion of Candia (Iraklion), and the death of several hundreds of Cretan Christians as well as 14 British soldiers and sailors. Brought about by a miscalculation on the part of the European Admirals who effectively ruled Crete at that time, and an even greater miscalculation on the part of the British Army commander on the spot, Lieutenant Colonel F. M. Reid, 1/Highland Light Infantry, the events of that day are commemorated in Iraklion by the name of the main street leading from the town centre to the harbour; the site of the outbreak of rioting. On one level a riot which saw the deaths of so many people and the destruction of so much property seems nothing to celebrate, but on another level, the events that day culminated a few months later in the departure of all Ottoman troops and authorities from Crete, paving the way to the creation of the Cretan State, Κρητική Πολιτεία. 25 August Street before riot. Looking down to the harbour. 25th August Street after the riot. Many thanks to Zacharias J. Nikolakakis for the photographs. This entry was posted in European Intervention Crete, Highland Light Infantry and tagged 1/Highland Light Infantry, 1/HLI, Candia 25 August 1898, Candia 6 September 1898, Candia riot 1898, Crete 1898 on August 25, 2015 by Mick McT. 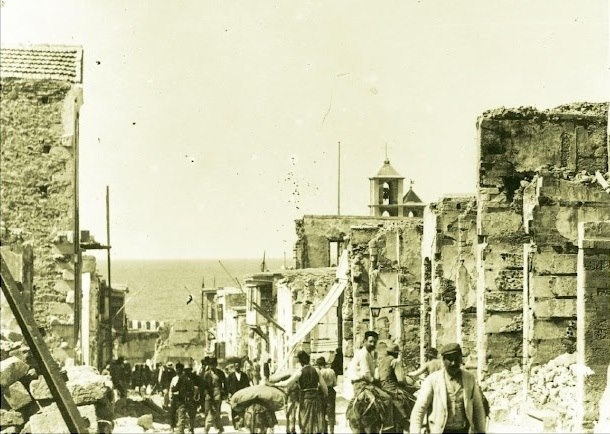 Following the rioting in Candia on 6th September 1898, which left 14 British military personnel, and a number of British citizens, dead – not to mention some 400 Cretan civilians, mostly Cretan Christians – the British reaction was swift. Courts martial were set up to try those accused of killing the service personnel and a Military Tribunal to try those accused of killing British civilians. Neither judicial body allowed appeals against their verdicts. 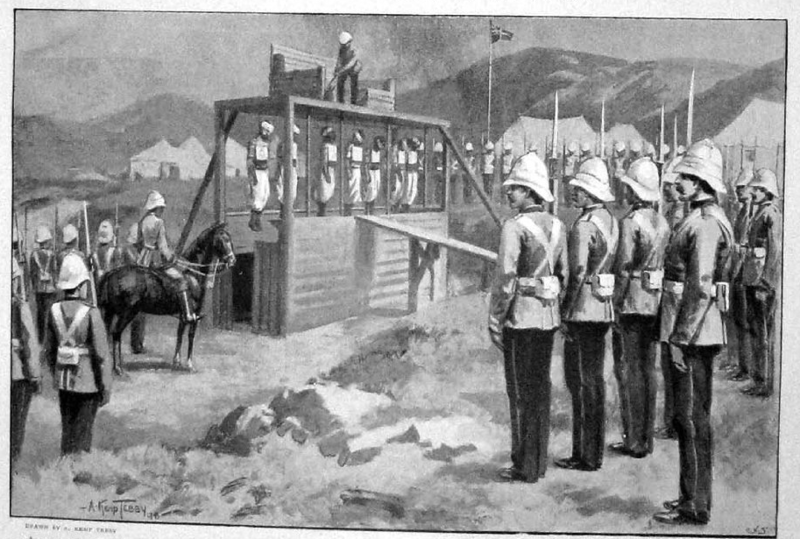 Capital sentences were passed on 12 men for the murder of British soldiers, none appear to have been tried for the murder of British sailors, and five men condemned to death for the murder of British civilians. The prisoners were kept on board H.M.S. Isis while awaiting both trial and subsequently their execution. 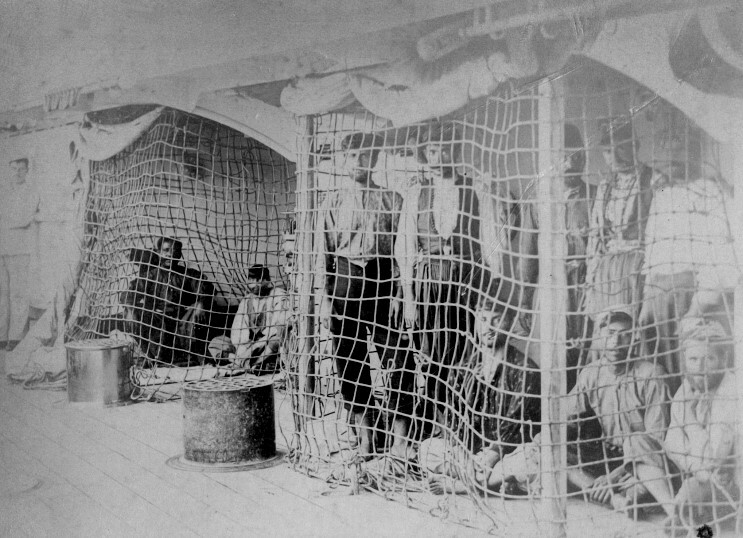 Cretan Muslim prisoners on board H. M. S. Isis. 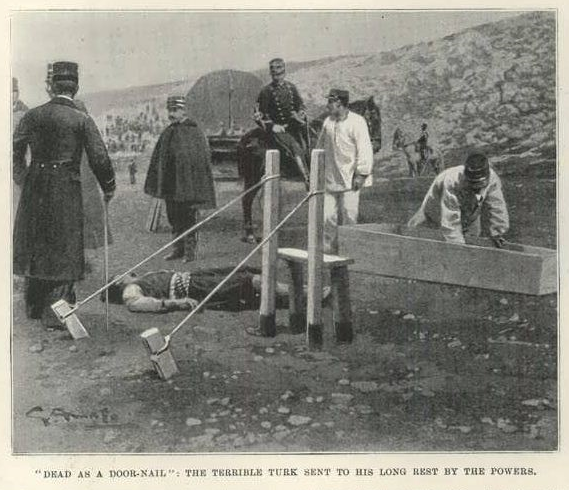 The first batch of 7 men were hanged on 18th October 1898, The Graphic covering the executions in some detail in its issue of 5 November 1898. 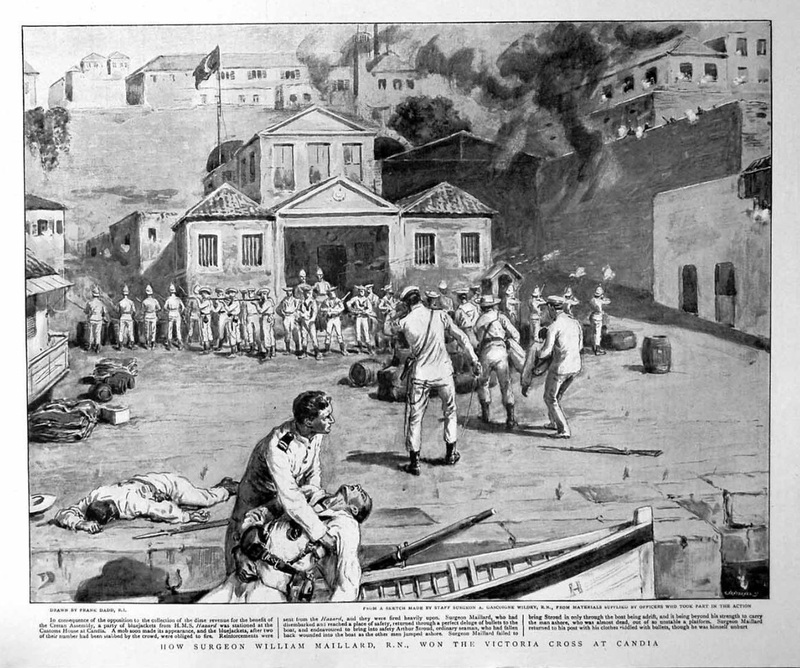 Execution of rioters. The Graphic. 5 November 1898. 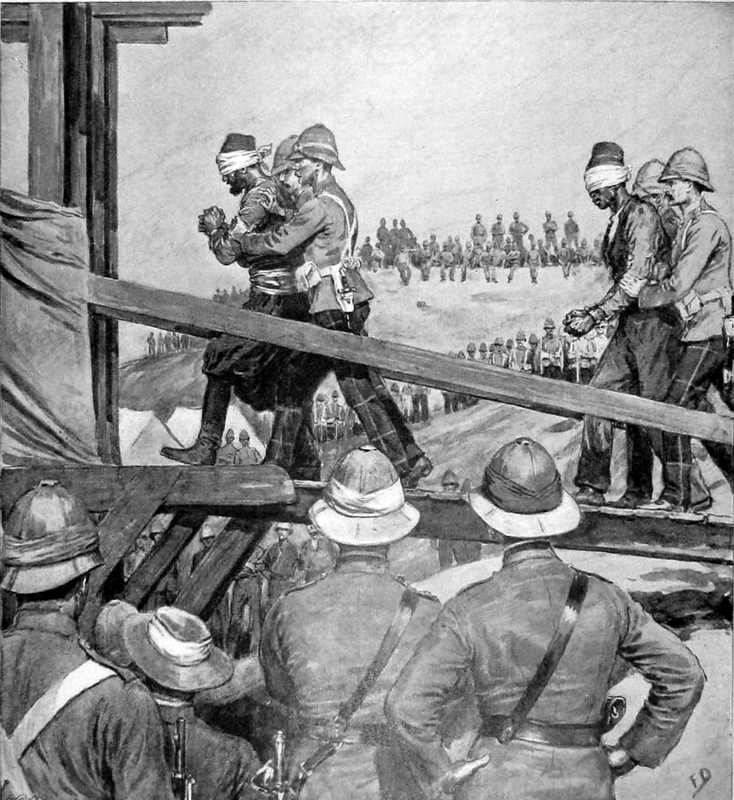 The magazine returned to the subject on 3rd December 1898, this time featuring the execution on 7th November of three of the men convicted of murdering British civilians. The Graphic 3 December 1898. This entry was posted in British Army in Crete, European Intervention Crete, Highland Light Infantry and tagged Cretan Muslims, Crete 1898, European Intervention Crete, Highland Light Infantry on March 2, 2015 by Mick McT.